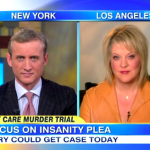 Dan Abrams and Nancy Grace appeared this morning on Good Morning America to discuss the final day of of the Dunwoody Daycare murder trial. Closing arguments take place this morning. From the beginning, Dan insists what a “very tough case” this will be for the defense, making the insanity plea. The prosecution has done a pretty good job at rebuttals, and the defenses best hope, Dan says, is for a hung jury – that the defense, in a closing argument, will manage to convince “one, two, three jurors that they think he was insane. [It’s] a long shot.” Nancy makes note of the fact that late yesterday, it was decided that the state would also get the final closing argument, which she called a powerful advantage. Agreeing that in an insanity case, there is something of an affirmative defense, Nancy maintained that the state does have the “overarching burden” of proof. 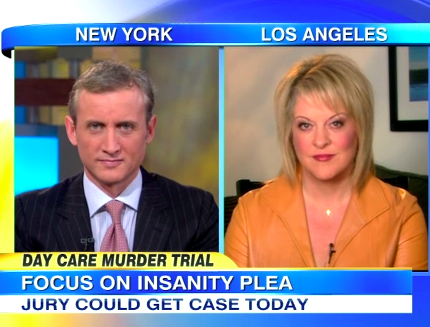 Then again, she added, “[Neuman] can’t even keep his demons straight.” Watch Dan Abrams and the full discussion here.